Ghana, Sierra Leone and the Ivory Coast are home to the wonderfully bizarre and strange looking Rockfowl (Picathartes gymnocehalus) – something like a cross between a roadrunner and a crow. The highly prized species for world birders is a communal and cave dwelling creature that hops and bounds through the vine-filled lowland forest floor. This rare, mysterious and secretive bird builds mud-cup nests in caves or the undersides/overhangs of massive boulders that jut into the humid forest. I had the opportunity to visit Bonkro Village in Ghana where locals have become custodians and guardians of this once hunted creature. Both the village and forest creatures have benefited from the birds protection via eco-tourism. After a long escorted hike through the hot and humid secondary forest we arrived at a group of huge cave-like boulders draped in vines. We sat quietly waiting for the Rockfowl to return to their roosting and nesting site at dusk. After a tense couple of hours, we saw one, then two and finally three fantastic whacked out looking birds bound in through the jungle. One hopped up on a nearby boulder and looked seemingly right into my eyes. An astonishing moment for me and my comrades. What a bird! We are pleased to be currently working in conjunction with Ashanti African Tours through their PECK Fund (Picathartes Education and Conservation for Knowledge Fund). 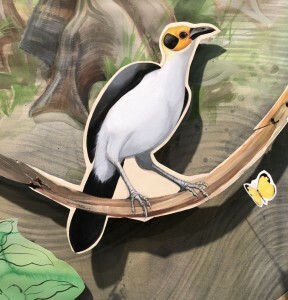 This new 9.5”h x 9″w fine art digital print we are offering is limited to 50 signed copies with proceeds from the sale going to help preserve the nesting sites for the Yellow-headed Picathartes. 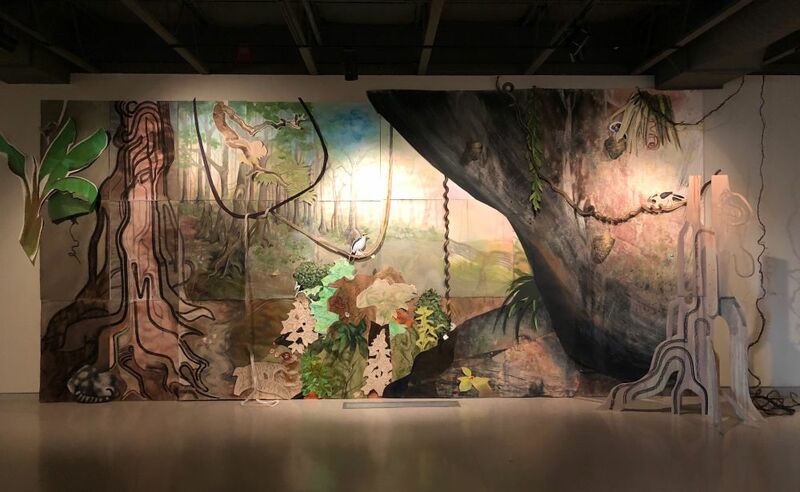 The print is a detail segment of a 12′ x 26′ diorama I installed at the Fresno Museum of Art earlier this year. Buy Now!